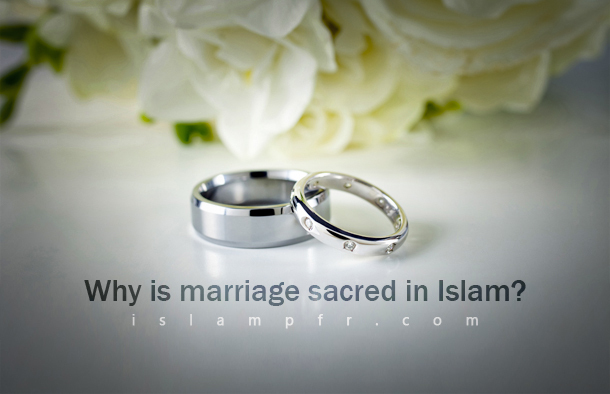 Home Articles	Why is marriage sacred in Islam? So, there shouldn’t be a negative perspective to everything that pleases humans. Although eating pleases human (the desire for food), it is also necessary and sometimes even crucial to keep him safe and alive. If Islam values marriage, it’s not just because of the sexual aspects of it; but also, it’s due to precious results beyond it. Marriage is not just for satisfying sexual desire, it also has aspects of spirituality and mental and psychological health. Marriage is for reproduction of legitimate humans, choosing companion and partner and consultant in life. Marriage is a mean to accomplish spirituality and achieve ultimate goals. Marriage is for strengthening social bonds and contracts and these aspects should be noted, although satisfying sexual desire has divine reward if it is done for God’s sake and also makes men and women immune from sins or becoming associated with mental disorders due to sexual desire complexes. In divine system and Quranic culture the main purpose of marriage is reaching mental peace and mind comfort, attaining the growth path, achieving human perfection and seeking nearness to Allah. Undoubtedly, avoiding loneliness, becoming partner and spouse, making independent family, satisfying human natural and innate needs and having offspring as natural results of marriage, are also among important factors in mental peace, mind and soul comfort and inner satisfaction. In this verse and Surah Al-A’raf, verse 189, Allah besides regarding the true essence of men and women as the sameand considering no superiority among them due to the origin of creation, expresses mental and psychological tranquility as the purpose of marriage and woman as the course of tranquility. One of the marriage’s side purposes is to have children and to preserve the generations of humans. Marriage is the Godly answer to human innate need; because Allah has created sexual desire in human. From Islam’s perspective, not only celibacy is not considered as a virtue, but also it is known as an imperfection and a reason for loosing numerous spiritual blessings.